There is no doubt that social media is changing the way brands and businesses communicate with their customers every single day– one of the main driving factors behind this is the customer’s ability to interact and engage with their favorite brands. Every social media platform out there has a private messaging feature- Facebook has a private chat application, Messenger; Twitter and Instagram have their Direct Message (DM) systems. Today, almost every brand out there is active on one, or all, of these platforms to be available to their customers. What is interesting to note here is that the usage of social media platforms has increased tenfold, and the usage of messaging platforms has grown dramatically more than the usage of social networking apps. 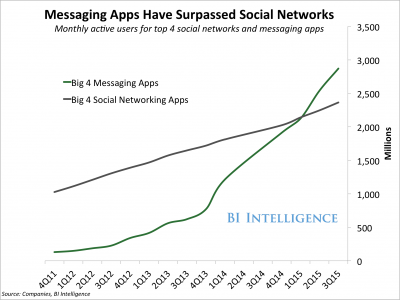 Check out the growth of the big four messaging apps (in grey) versus the social networking apps (in green). Every social media network has a private messaging system, in one form or another. It is not only used by people to send messages to each other, but it is also leveraged by consumers to interact with their brand pages– here lies a golden opportunity to start using a messenger chatbot. What exactly are messenger chatbots? Messenger chatbots are robots, built using artificial intelligence and machine learning, which have quasi-conversations with people using the service– think of it like a Siri built for your Facebook messenger. Chatbots have conversations with you giving you the information you’re looking for with a lighting fast response time. Businesses actively use messenger platforms as a customer service tool to provide their customers with information and offer support or any other assistance that they might require. Usually these messenger platforms are controlled manually by the social media team who reply to messages personally. However, there is a delay time in this process. Most social media managers would agree that many of the questions asked by customers are simply repetitive. Facebook does provide a custom created answer that can be used to reply to customers, however, manual input is still required. Chatbots are not to be confused with messenger auto replies. Messenger auto replies are sent out by the page as soon as you send a message to it, but are only on the lines of “We’ve got your message and we’ll get back to you shortly.” This used to work back in the day when customers believed that their concerns had been heard and that some action was being taken into it. However, these days, everyone is aware that no one checks these auto replies. This creates an inhuman and isolating way of interacting with your customers. On the other hand, messenger bots allow for a conversation with customers to take place and give it a much-needed human touch. For example, a customer is in the immediate vicinity of your store and wants to know its timings before actually visiting the store. He or she sends a message to the page and awaits a reply. Let’s say that your social media manager takes an hour, which is an accepted response rate, to get back to him/her. By that time, the customer is no longer in the vicinity and that footfall is lost. Now consider this, if the page had a chatbot installed, the chatbot would have directly sent a message with the store timings to the customer, and it could have also given them directions to the store or offer them an option to call the store. That’s the magic of a chatbot! All of this looks great on paper, but does it really work in real life? 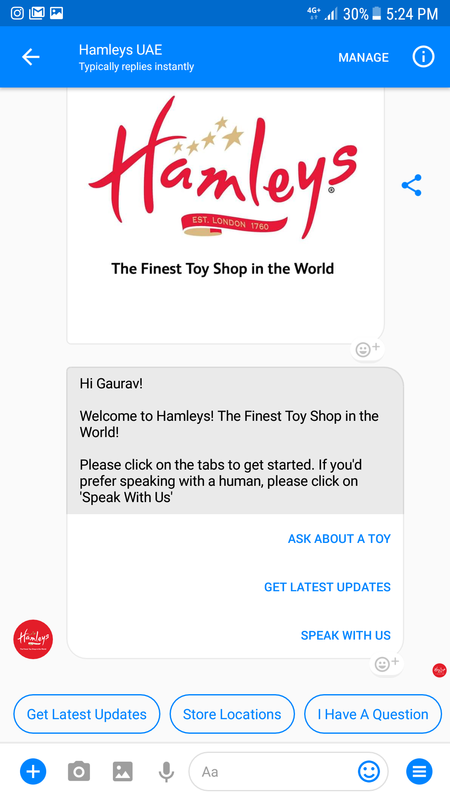 Let’s take the example of Hamleys UAE that uses a chatbot to interact with its customers. As soon as you send the page a message, you are greeted with the following screen. As you can see, the bot personalizes the message for you and gives you a few options you can choose to reply. Let’s say you want to know the store locations– you can tap on the store locations tab and that will bring you to the next screen. Moving on, you are now interested in visiting the store and want to get directions, which is possible by the bot too. This whole conversation goes on without any human input. There is much more that the bot can do– it can allow you to make a call to the store, ask about a toy by sending an email, or even let you subscribe for the latest updates. Now imagine a page that has over 120,000 fans, such as Hamleys UAE. Can you imagine the number of messages the page would be receiving? Adding a chatbot to such a page also enables you to not only save time but also create for a unique experience for your customers. 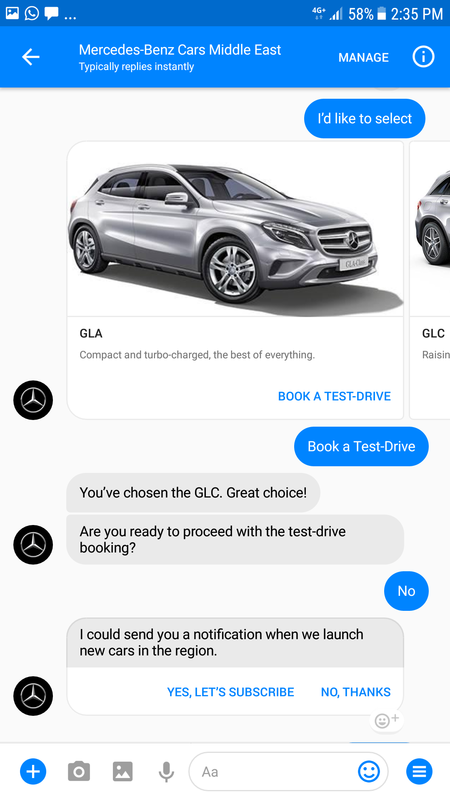 Another chatbot that is also interesting to check out is the one built by Mercedes Benz Middle East. Not only does it start a conversation with you but it also allows you to choose a car and register for a test drive in the process. Messenger chatbots are the latest fad in social media marketing and you can see now why the system is here to stay. I’m excited to see more chatbots being built in the region, in addition to exploring how we can take customer service to the next level with these technological advancements. Got a cool chatbot that you came across, hit me on Twitter @gauravprksh and I’ll check it out!